From day one, we've been committed to providing you with the best tools and products to attract and engage local consumers. Whether it's tools to blog, build coupons, send e-Newsletters, or advertise on search engines like Google and Yahoo, you've been able to do everything easily and effectively. Our network of 800,000 local merchants, now sees more than 20 million unique consumer visitors a month! With our new partnership with Demand Media, (read the press release here or here), you can now add dynamic, unique business content on your local listings. Say you're a consumer searching for a local auto mechanic, once you get to a MerchantCircle member's listing, not only will there be your created content (blogs, newsletters, pictures, coupons, etc. 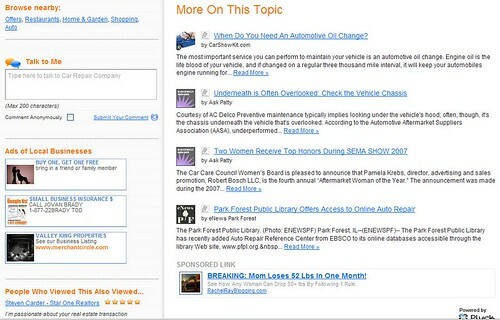 ), you can also have content like the articles shown below on automotive issues and news. This will give your potential customers a truly one-stop shop for all their business-specific needs and interests. Find out more about adding Rich Content through your MerchantCircle dashboard here. eNom, a Demand Media company, will also be powering our Instant Website and unique email offering. Let's talk about when you should look for a mechanic, and when you should just use the service shop at the car dealer. In general, mostcars that are still under warranty should be looked at by the dealer shop if there's any mechanical problem with the car. Thanks for the wonderful read. Good that you have done a great deal of home work related to the topic. Keep up the Good Work. Toronto Apartment Window Cleaning | Top quality, professional apartment window washing services, at the best prices. Thanks for providing so many facilities in one centralized package.I come to know various things you are offering, I have read such a useful article. Thanks for providing such an information in centralized package.I come to know various things you are offering, I have read such a useful article. What Businesses Have the Most Risk of Failure?